Composer, musician, and poet Lourdes Pérez. She's the creator of the book/CD collection, "Still Here: Homenaje al Westside de San Antonio." Guadalupe Bertha Flores, 97, a West Side San Antonio native and U.S. Navy veteran. West Side native and resident Jesse Vidales, 97, a veteran of the U.S. Army. Musician, composer, and poet Lourdes Pérez gathered the oral histories of 12 of the West Side’s elders and set their stories to music. Pérez said 20 San Antonio musicians took part in the project, which took two years to complete. One of the songs in the collection is “Salimos Ganando,” or “We Came Out Winning.” Pérez says it was inspired by the story of Lucy Perez and Ray Pérez (no relation), who frequently entered and won dance competitions. Enrique and Isabel Sanchez, West Side residents, and parents of Graciela Sanchez. Portrait by Antonia Padilla. On a drizzly, misty, cool Sunday afternoon, the Esperanza Peace and Justice Center was packed with young and old to hear more of these stories. 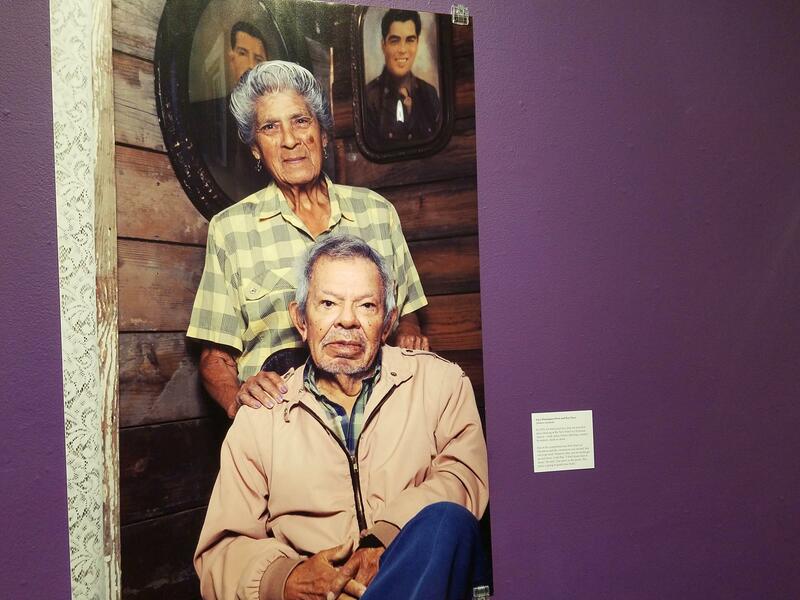 Large portraits of the West Side’s elders by photographer Antonia Padilla line the walls. Guadalupe Bertha Flores is the oldest woman in the room, born on March 16, 1921. The 97-year-old grew up on the West Side. Flores was the youngest of seven children and served in the Navy as a switchboard operator at the tail end of WWII. In a shaky alto voice, she said as soon as she joined the Navy, the war came to an end. “I wasn’t barely a year, a year-and-a-half (in the service),” Flores said. “The minute they saw me come in they stopped the war. A portrait of Lucy Pérez and Ray Pérez, whose stories of entering and winning dance competitions inspired Lourdes Pérez to compose the song "Salimos Ganando." Portrait by Antonia Padilla. As a child, Flores remembers playing “nurse” with the other kids in her West Side neighborhood and giving them green grapes as medicine. Her parents grew a large grapevine across their front porch. 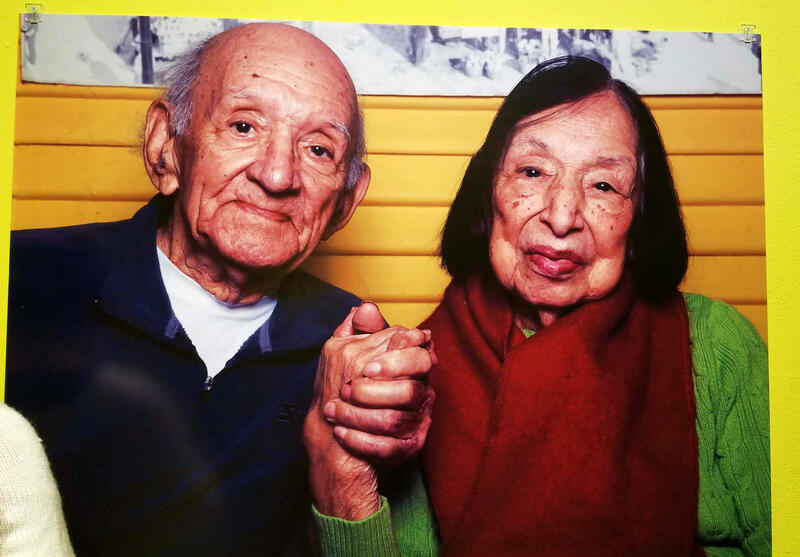 Another West Side elder Jesse Vidales, 97, is only slightly younger than Flores. “I was born there in 1921. … I’m still here,” he said. He added the only time he left his “wonderful, beautiful West Side” was when he joined the army in 1943. And Vidales said he’s not going anywhere, yet. “According to what I have heard, my doctors and the VA, they tell me I’m going to live another 20 years,” he said. 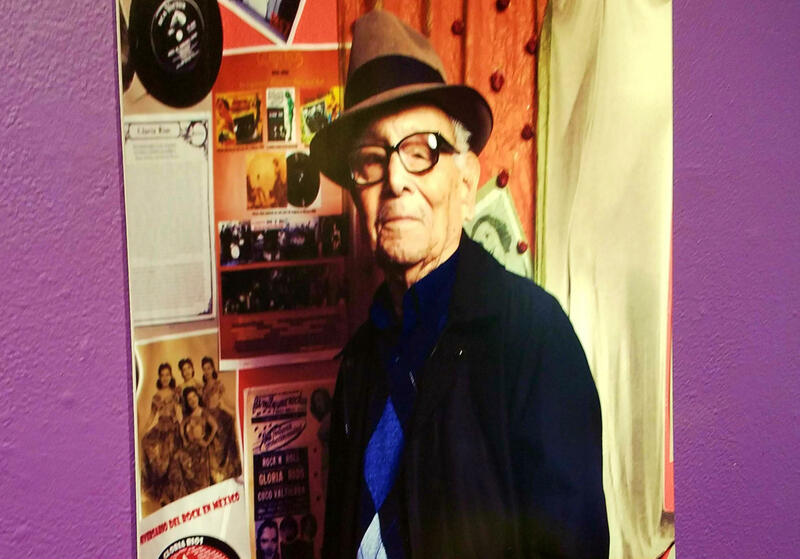 West Side resident Jesse Vidales, 97. Portrait by Antonia Padilla. Over the decades the West Side of San Antonio has been subject to urban renewal that has displaced many residents and demolished historic buildings. Alazán-Apache Courts was the first public housing project in San Antonio. It was built in 1941, after San Antonio priest Carmelo Tranchese lobbied Eleanor Roosevelt to create affordable housing in San Antonio’s impoverished, mostly Mexican-American West Side. The Esperanza Peace and Justice Center and the Westside Preservation Alliance have collaborated for the new exhibit “Los Courts.” It highlights the residents and culture that grew out of the projects. Reyna grande means “grand queen” in English. But author and memoirist Reyna Grande hasn’t always felt like she’s gotten the royal treatment as an immigrant. She joins us to discuss her memoir “A Dream Called Home” (0:18). Then, we bring you a story about a West Side San Antonio housing project, highlighting the history of the Alazán-Apache Courts (15:11). A new book for young adults reflects on the life of voting rights activist and West Side San Antonio native Willie Velasquez. Author Bárbara Renaud Gonzalez (0:17) joins us to discuss her new novel. Then, a West Side San Antonio record shop spins the oldies and keeps neighborhood pride alive (15:57). One of San Antonio’s oldest neighborhoods dates back nearly 300 years. But by the 1970s, gentrification led to the demolition of an area west of the San Pedro Creek: Barrio Laredito. On this episode of Fronteras, we talk to cultural anthropologist Citlali María Zentella and archaeologist and historian Jorge Luis Garcia Ruiz (00:16). Then, with early voting underway, one Native American comedy troupe is using humor to increase voter turnout among the American Indian community (11:45). Fronteras Extra: What's Left Of Barrio Laredito? Barrio Laredito was established in what’s now downtown San Antonio, just west of San Pedro Creek. Though the small neighborhood disappeared due to gentrification in the 1970s, its nearly three-centuries-old culture lives on. Binisa Zentella, a folklorist researching the music from Texas and its ties to Spain and Latin America, said the cultural resilience of Barrio Laredito allowed its residents to express themselves in a way that they couldn’t outside the neighborhood. San Antonio Light UTSA Libraries Special Collections. In 1938, 10,000 pecan shellers in San Antonio went on strike. These were not your typical blue-collar workers. They were women; they were children; they were the elderly; and they were poor. But primarily, they were Mexican. On this episode of Fronteras, we talk to filmmaker Anne Lewis about her new documentary, “A Strike and an Uprising (in Texas)” (0:16). Then, TPR’s David Martin Davies tells us about the “secret history" of San Antonio (12:34).